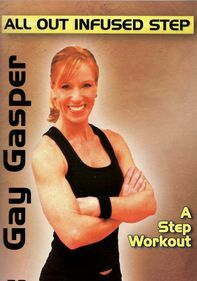 Firm up your entire body, increase your metabolism and burn fat with fitness expert Gay Gasper's cardio plus toning exercise program for intermediate to advanced fitness levels. Gasper's routine, which requires a step bench and an X-ertube, transitions from step aerobics to a combination of aerobics and toning and back to a mix of high- and low-impact aerobics. The program also includes floor work that specifically targets abdominals.